The big bang is a good story … as far as storytelling goes. We have all heard that line: “If you are going to tell a lie, tell a big one.” That is one form of a quote attributed to Joseph Goebbels, which is cited in Adolf Hitler’s book Mein Kampf as “… in the big lie there is always a certain force of credibility.”2 Goebbels was Hilter’s propaganda minister in Nazi Germany, and knew the importance of a good story. As a physics professor working in a secular university in Australia, and publishing in scientific journals, and knowing the importance of communicating one’s science to the wider community, I have had many opportunities to see how the system works. Outside of the experts in your field the details do not matter, but a good story does. As an illustration of this let me relate a story from early 2013. At that time I published a cosmology paper,3 which included an interesting concept. I found that using an alternative cosmology in a finite bounded expanding universe, with a unique centre and an edge, one could get the same physical description of the large-scale structure of the universe, which fit the observed data well. But this was without the need for the inclusion of ‘dark energy’ or ‘dark matter’ fudge factors, as is necessarily assumed in the standard big bang cosmology with no centre and no edge. It was only a theory paper published in a lower ranked journal, so I didn’t really think much about it. But then I received a call from someone in the publicity department at my university who wanted to speak with me because she wanted to write a press release on it. She asked me what I felt was important about the paper. I told her that the paper was consistent with the notion that our galaxy could be located in a privileged location in the universe. This was contrary to the oft quoted cosmological principle which states that there are no privileged locations—that our location is purely random and the universe has no centre or edge. My paper suggested that that is not necessarily so. Once she understood what I was saying, her facial expression told me everything. And she said: “I don’t think we can do anything with this.” And I never heard from her again. I had published the science, passing peer-review, but the real story could not be told because it was contrary to the one the establishment promoted. Silence was preferred. Modern day cosmology has developed a ‘good’ story. The general public knows it very well. But they have absolutely no knowledge of the details, nor if they were presented to them could very many of them even comprehend them. So the usual script is adhered to, and if you don’t depart from that you can get out your message. But suggest something different, i.e. our galaxy in a special location, and you will hear a deafening silence. Of course, that means you won’t hear anything. You, the author, will be ignored. But for those who accept the standard paradigm—the Λ Cold Dark Matter big bang story—you won’t have any problem getting out your story. That story, which is told over and over again, is filled with made-up stuff, dark matter, dark energy, dark radiation, inflation epoch with inflaton fields, expanding space, big bang singularity, quantum fluctuations of a false metastable vacuum, colliding hyper-dimensional branes, and still there are more. Who understand what these things are? The general public certainly doesn’t. The experts can’t really because none of these have ever been discovered or demonstrated in a lab experiment. But they are all needed in the modern big bang story and it is really one big story. If you are going to tell a lie, tell a big one. But I am not suggesting that any cosmologist is actively lying. I don’t believe that. But consider this. Near the beginning of time, according to the true history of the world, God’s adversary Satan deceived the first two people with a lie (Genesis 3: 1,4). He is the father of lies (John 8:44). Satan has since deceived nearly the entire world. So you should expect that he would have a really good story and that he would have had his agents promoting his false history of the Universe. The story is marketed as being ‘scientific,’ which is meant to make it more credible. And thus most of the professing Christians, many of those in the traditional and mainstream churches, have been taken in by this. The modern big bang story is a really philosophy of man where he can satisfy himself with a creation story that eliminates the Creator. Paul’s warning to the Colossians is as true today as it was then. Do not be captured by some man-centred philosophy based on elementary principles of man’s devising. This is God’s message to believers. Cosmologists are largely non-believers, but a few profess faith in Christ. And to be fair, the big-bang-believing atheists are only operating according to their own nature, which requires that they believe in a worldview devoid of a Creator, or, at most, they believe in the laws of physics, or, the Universe itself as creator—a New Age god. At least, they are internally consistent with their worldview. However, the big-bang-believing theists, are either deceived as ‘the blind who will not see’ or as ‘the blind who cannot see.’ They are internally inconsistent with their worldview. The big bang story has become the most popular story of both the structure and origin of the universe. That cosmic evolution story is a complete epic, which starts with just hydrogen gas and after 13.7 billion years we end up with people and all sorts of living creatures on a beautiful blue fertile planet at ‘just the right distance’ from the sun that ‘just looks like’ it was designed for life. There’s a story, and it is still being written. According to the story, soon after the big bang, out of the hot plasma, protons and electrons combined to form hydrogen and helium gas only in the expanding Universe. These were the only final products of the big bang fireball, so the story goes. Since these atoms were no longer ionized (they are neutral) they filled the darkness of space or what we should say will become the inter-galactic medium (IGM). According to the story, this was before the formation of any stars or galaxies. Neutral atoms do not emit light and thus this period in the story is called the cosmic ‟Dark Ages”. Fig. 1 outlines the whole cosmic epic story from the big bang, the cosmic microwave background fireball, through the cosmic ‟Dark Ages” before stars and galaxies formed, to the era of Reionization, when the first stars formed, emitting a lot of light, which illuminated the darkness and hence re-ionized the free hydrogen and helium atoms in the IGM. So the first galaxies formed in the period between 300 million and 700 million years after the big bang, so the story goes. Prior to this Reionization era all radiation at wavelengths consistent with the states of neutral hydrogen was absorbed and hence that is the reason it is called the cosmic ‟Dark Ages”. These atoms, according to the story, only absorbed light, and emitted none, hence the label. New observations of a so-called ‘young’ galaxy, one of the youngest and most remote galaxies ever found, indicated something surprising. See Fig. 2. The galaxy named A1689-zD1, was observed using both the ALMA (Atacama Large Millimeter/submillimeter Array) and the VLT (Very Large Telescope) with the aid of magnification by a gravitational lens of the Abell 1689 galaxy cluster. It is alleged that the light we now see from the galaxy was emitted when the Universe was only about 700 million years old, or only five percent of its present age. Of course, this is the story being told. As this new discovery unfolded it was realized that if we are observing a lot of far-infrared radiation from the supposedly infant galaxy then that means it must not be so infant after all. The reason is that, according to the current theory of star formation and their evolution, it takes billions of years (many stellar generations) to build up all the heavier elements, greater than helium, which astronomers call metals. This is because according to the story, they have to be manufactured in the bellies of stars. They weren’t all made in the beginning. The big bang fireball could not create them. So how can such an infant galaxy have so much dust and such complex chemistry? The chemistry must include elements like carbon, nitrogen and oxygen etc. Also it was revealed that the ‘young’ galaxy not only contained dust, but had a dust-to-gas ratio that was similar to that of much more mature galaxies. This was a big surprise. The story is pliable. This is good story telling. Nothing can disprove the story, because anything you find can be made to fit into it. But let’s not let some facts get in the way of a good story. The new discovery, is inserted into the story line. Somehow the stars evolved from the primordial gas much earlier than expected or they built up their stores of metals by rapid fusion reactions much earlier than expected. Yet this galaxy was not as large in size as expected. Many other galaxies found at this stage of the story were much more massive than expected, so this one is called typical. You see? It does not really matter what is discovered, now or into the future. The story will always be re-written or corrected or embellished. In cosmology this is what is called ‘science’. I call it good story telling. But actually there are no known processes that allow the stars to form by themselves in the first place. The reason for this is that real science tells us as that as a gas cloud compresses under its own gravity, which, without a Creator, is how the first stars would have had to have formed from the hydrogen and helium gas in the intergalactic medium (the space between galaxies), it heats up and the resulting increased gas pressure prevents any further collapse of the cloud. Some have proposed ingenious methods of cooling, by infrared radiation from molecular hydrogen clouds, but these cooling mechanisms are impractical, and cannot provide sufficient cooling over such relatively short time periods. But the story must continue. The answer then is obvious they say. It is dark matter that provides the solution.8 In order for the clouds of gas that formed into the first stars to begin collapsing there needed to be a lot of dark matter around to make the cloud to collapse under gravity. Thus a far stronger gravitational force can be achieved, especially if you start your story with as much as 90% or more dark matter. That must be the correct story, because it did happen we are told, and we know this because we are here to talk about it. So dark matter is invoked at the critical moment in the formation of the first stars, at the beginning of the era of Reionization, which brings the Universe out of the ‟Dark Ages”. The stars also form into galaxies. More dark matter is needed for that to happen, because again without the hypothetical, unobserved stuff, no galaxy can form naturalistically. It is an irony that professional astrophysicists can propose all sorts of hypothetical unknown stuff, but they cannot accept creative action by the Creator. One exception seems to be the theistic evolutionists permit God to start off the Universe in the big bang. Now according to the story the first galaxies were small and hence ‘young.’ Only by accumulating more mass by merging with other galaxies could they ‘grow up’ and become more ‘mature.’ So in this era of Reionization only small ‘young’ galaxies are expected. But as already stated a high percentage of those observed are more massive than expected. But no need to worry, that also will be worked into the story. It is a never-ending story after all. What have we learned from this? Never let the truth get in the way of a good story? Well, yes, but more than that. Cosmology is not science. It is a philosophy, a belief system—a story—that is used to place all the evidence, the observations, into. It is already believed. The overarching plot is already known. No matter how crazy the story gets, with unknowns, fudge factors, that is ok, as long as the story is preserved. Where did the story come from? Not from God. It hardly resembles His story,9 the true history outlined in the Genesis account in the Bible. Thus it must have come from Hell—from the father of lies, the Devil himself. This story he has used to deceive the world, that there is no Creator and hence no God, because the Universe, and everything in it, just made itself. But I don’t believe it! J.G. Hartnett, A valid finite bounded expanding Carmelian universe without dark matter, Int. J. Theoretical Physics, 52 (12): 4360-4366, 2013. J.G. 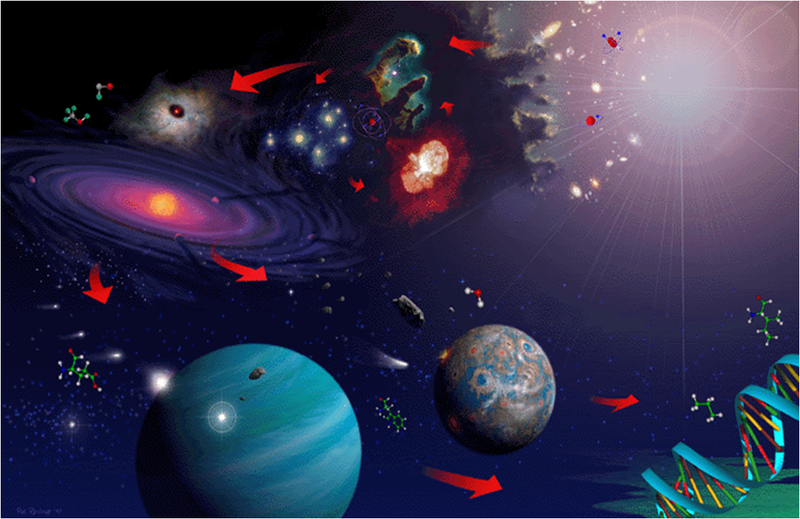 Hartnett, Is there definitive evidence for an expanding universe? J.G. Hartnett, Why is Dark Matter everywhere in the cosmos? J.G. Hartnett, The big bang is not a Reason to Believe. Is Dark Matter the Unknown God? It is true that its wonderful storytelling but the ‘fact’ that no one was ever there to see such things should be contrasted with the one event that would destroy such imaginings. If I’m correct if you find one exception to a theory then it reduces the rigor of excepting that theory. For us that one exception is the resurrection of Christ: an event that materialism can’t except but it was witnessed by so many that any court would except their testimony. Yet men who dream up these ideas in the name of science should look at that one fact in history and how it has changed the world.